This group of kids was playing up high in a tree limb over the Nam Song River in Laos, when my kayak rounded the corner. As they saw me they whooped and hollered, and I could tell mischief was in their minds. I quickly got out my camera from the dry bag, and took one quick shot before storing it safely away. As I neared, they all jumped into the water at once, yelling and swimming frantically towards me. It was all fun and games but I didn't want them to flip my boat even with my gear in a dry bag, so I paddled quickly before they could latch on. Inside this ancient walled city a gardener tends to the nursery of flowers. Imperial City, Hue, Vietnam. Every time the conditions were right and a rainbow appeared I ran up to the Joyner Ridge trailhead as fast as I could and tried to capture this shot. This was one of those times. 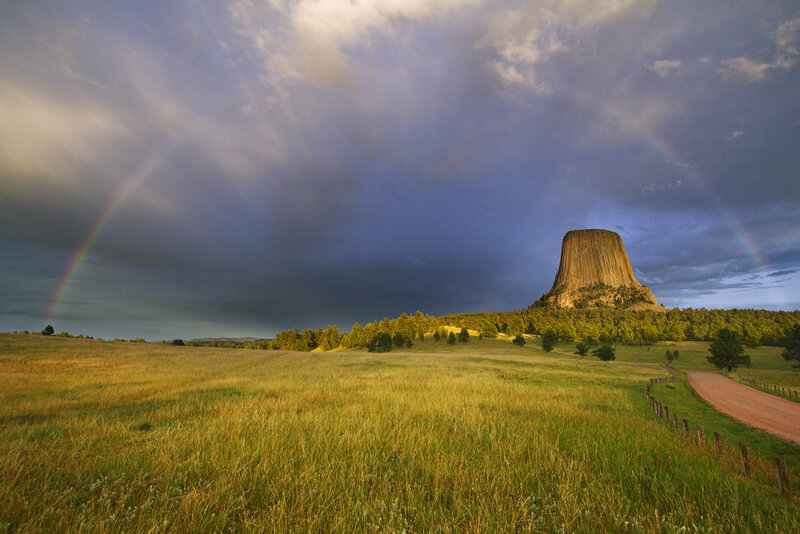 Mato Tipila (Devils Tower National Monument), Wyoming. One of the most remarkable sunsets I've seen. Bishop, California. Resting in a tree in Tonsai, Thailand. The eye of one of the adult elephants at the Elephant Nature Park satellite site. The elephant tourism business in Thailand is big money and can be a shady and brutal business. The elephants can often be treated terribly. However, there are some business that are reputable. You should never ride an elephant. The training for the elephants to allow people to ride them often involve beatings and other harmful practices. If visiting an elephant tourism site, thorough research is essential, to make sure you are not supporting a place that is harming elephants. Eric Bissell works out the moves on the route 'Top Gun,' one of the longest standing un-climbed projects in Tuolumne (first tried in 1985). He tried the route over 5 seasons before finally sending in July of 2016. This photo is from an attempt in 2014. The route is easily visible on the standard climbers descent from Stately Pleasure Dome. Tuolumne Meadows, Yosemite National Park, California. Pim Shaitosa really goes for it on the short but punchy crux of ‘To Exist is to Resist’ 5.11d (7a). Nam Pha Pa Yai, Thailand. Climber Kate Sabo, pulls on one of the best and definitely the most iconic climb in Ha Long Bay. Half the adventure is reaching the route by hiring a boat driver to take you about 1 1/2 hours from Cat Ba Island to reach this small pinnacle of rock in the middle of the sea. The route is characterized by amazing quality vertical technical limestone with lots of pockets and side-pulls and rated 7a+. Vietnam. The Cathedral Range peaks of Unicorn and Cockscomb are lit up in orange alpenglow at sunset with the Tuolumne River rushing in the foreground. In the cold of a December morning I crept into the small wooden hut before dawn and waited. Just enough room for me and my camera gear, there was a hole in the wall big enough for a camera lens to peer through. In the early grey light this Bald Eagle (Haliaeetus leucocephalus) perched and sat, contemplating who knows what. Perched in front of its aerie, this Peregrine Falcon (Falco peregrinus), had at least one chick that could be heard begging for food. Castle Rock State Park, California. In the streets of Liming, Yunnan, China. At Hoan Kiem Lake, or Lake of the Returned Sword, lies the Turtle Tower. In the heart of Hanoi, this lake provides a respite from the busy city. Once or twice in a lifetime the wild flowers of Death Valley explode into rarely seen combinations of grandeur and diversity. I was lucky enough to visit for a few days in March of 2016. This image is of a Brittlebush or Encelia farinosa. Bridal Veil Falls is just a sliver on this winter day in Yosemite Valley. It was a magical morning that I captured this Snowy Egret (Egretta thula) on camera with the light just right as it waded in the shallows of the mud flats searching for small fish. Natural Bridges State Beach, Santa Cruz, California. A mother (Sphyrapicus varius) tends to her chick nested in a cavity of an Aspen tree. City of Rocks National Reserve, Idaho. Named after the zig zag scar shaped crack at the bottom of the route (and the Indian Creek climb of the same name), this is a fun and iconic climb in Laojunshan National Park, Liming, Yunnan, China. El Matador is the most iconic climb at Devils Tower, and also one of the most iconic in the world. The second pitch makes a perfect box in between two columns. It's all about the legs! Mato Tipila (Devils Tower National Monument), Wyoming. Something about looking at this image has always brought me a sense of peace and quiet. Maybe its the silkyness of the ocean and the steadfastness of the rock, or maybe just the memory of that time and place. Big Sur, California. These Mule deer (Odocoileus hemionus) try to fade into their surroundings in the Klamath Basin, California. Unexplained moving rocks on a desert playa in Death Valley National Park, California. The California Sea Lion (Zalophus californianus) takes a nap at the popular surf spot, Steamer Lane, in Santa Cruz, California. I came across this strange scene in the Eastern Sierra. I'm not sure what happened here, but the image captivated me. Though the common North American Coyote (Canis latrans) has been continually hunted and trapped for the past ~200 years this persistent and iconic species continues to thrive. These herons stalking prey in the Arcata Marsh made me fell as if I'd gone back in time to when dinosaurs still roamed this earth. Walking gracefully in the last light as the sky turns orange, on the 200 foot high-line over the ocean in San Luis Obispo. California. This wintery scene was briefly brightened when the clouds lifted for a few moments allowing a stripe of light on the Royal Arches and North Dome above. Lost Arrow Spire, an inspiration to climbers and slack liners alike. It was first climbed in 1947, and the first successful high line walk took place in 1985.